Dozens of free events including workshops, seminars, coffee mornings, film screenings and sports events will form part of the first ever Health and Wellbeing Week in Kerry, which is being organised by the HSE and Kerry County Council. The week will coincide with World Mental Health Day and runs from 6th to 14th October at venues across the county. 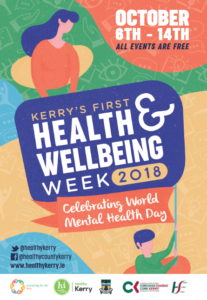 The first of its kind in Kerry, the Health and Wellbeing Week aims to promote a positive sense of wellbeing and will highlight mental health services and supports which are available to people in need in the county. Everyone is encouraged to take time out to learn, talk, reflect, and engage with others around the topic of mental health and wellbeing, and to encourage anyone with mental health issues to reach out and avail of supports and services available. The programme of events has come together with the support of all the local statutory agencies working together with the very positive input of community and voluntary groups all over Kerry. Kerry’s first Health and Wellbeing Week was launched today by Mary O’Mahony, Director of Nursing of the HSE and the Cathaoirleach of Kerry County Council, Cllr Norma Foley. The events are supported by Cork-Kerry Community Healthcare, through Connecting for Life, and by Kerry County Council, through Healthy Kerry. Among the highlights of the week will be a showing of the film, Pilgrim Hill, a panel discussion on the changing role of women in Kerry, workshops on workplace wellbeing, park runs, awareness sessions and more. Keep Learning – Try something new, rediscover an old interest. Take on new responsibilities. Fix a bike. Learn how to cook your favourite meal. Cllr Foley said the schedule of events was wide-ranging and timely: ‘This is a wonderful collaborative initiative between the HSE and Kerry County Council and will give us all an opportunity to focus on our own mental health and wellbeing. So many local community, voluntary and sporting groups have come on board to host up to fifty events. There are events in all parts of the county and I hope people will engage and get involved,’ she said. Full details of the programme of events are now available at local libraries, health centres and Family Resource Centres throughout the county. The full events list is also available on www.healthykerry.ie (where a day-by-day list of events is available) and on Kerry County Council and HSE websites.